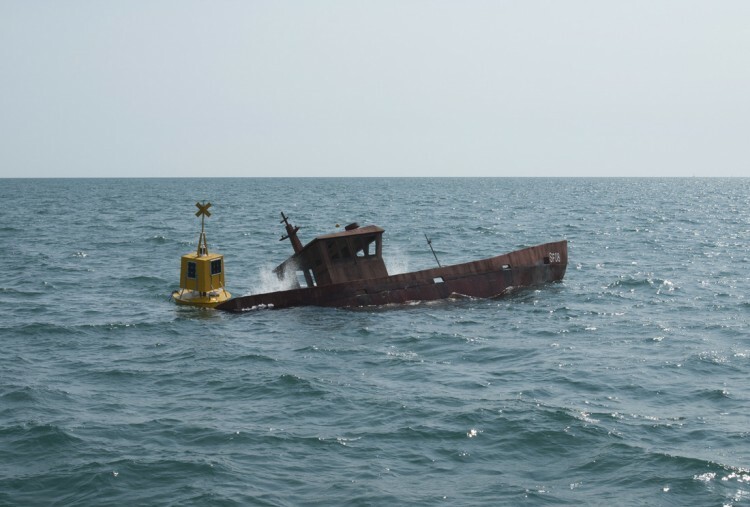 Simon Faithfull’s new commission, REEF, made in collaboration with marine biologists, began in August 2014 off the Dorset coast, where Faithfull’s boat was towed out to sea and deliberately sunk to form an artificial reef – serving as an underwater sculpture and a lasting legacy for marine conservation and diversity. Five cameras mounted on board charted the boat’s descent and will monitor its transformation until Summer 2015, transmitting images via a dedicated website, reeflive.org and relaying them to exhibitions premiering for Brighton Photo Biennial at Fabrica and later in Calais and Caen. Simon Faithfull is interviewed about the project. Simon Faithfull Interview for REEF Project from Photoworks on Vimeo. REEF is a co-commission with Fabrica, Photoworks, Musée des Beaux Arts, Calais and the FRAC Basse-Normandie (Caen). REEF premieres at Fabrica for Brighton Photo Biennial before touring to FRAC Basse-Normandie (Caen) and Musée des Beaux Arts Calais as part of two larger exhibitions of Faithfull’s work. REEF forms part of the project Time and Place has been selected within the frame of the INTERREG IV A France (Channel) – England cross-border European cooperation programme, part-financed by the ERDF. Please click here for live streaming from the sunken boat.